48 trips per day leaving OIA/MCO approximately every 30 minutes. We save you the expense of Fuel, Parking, and Tolls. We pick you up at your front door and drop you at your airline's front door. We're always open and we will never leave you stranded at the airport. Where do I find the van at the airport? Our vans always pick up at Parking Spot A45. We leave the airport approximately every 30 minutes, so if you missed a van, don't worry, one is just around the bend! 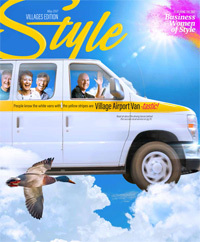 Village Airport Van was recently featured in Style Magazine, Villages Edition. "[Driver] Eddie was calm, polite, courteous, and acted as if we were the owner. Remembered our names. In my opinion, you have an A++ employee." "Very pleased with your service. I will definitely use again." "[Driver] was very polite + very personable and + most importantly he was a very safe driver."